Part of being frugal is knowing when to make less or more food. Sometimes you need to halve a recipe because the full amount would be too much for your needs. And other times you want to double a recipe so you can have extra to freeze. But it’s hard to do all that cooking math off the top of your head! That’s where a kitchen conversions chart comes in handy! So that you’ll always have the measurements you need on hand, I’ve put together a Free Printable Kitchen Cooking Conversions Chart! 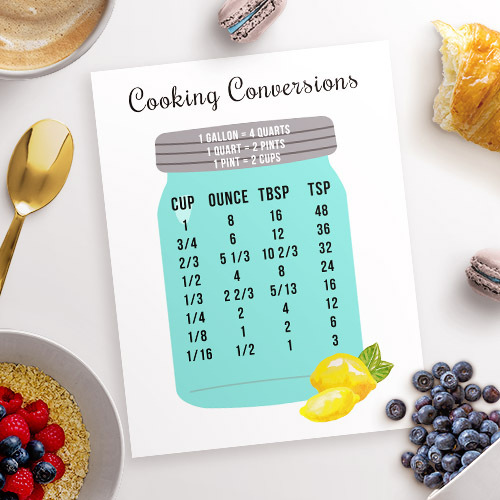 I love Mason jars, so I thought it’d be cute to give my kitchen cooking conversions chart a Mason jar backdrop! This printable cooking conversions chart is designed to fit a regular 8.5 x 11″ letter page. So it’s ready for printing and tacking up in your kitchen (I put mine on the side of the fridge), or filing away in the front of your recipe binder. 1. Download the printable from the link above. 2. Some browsers allow you to print PDFs from directly within the browser. If your browser doesn’t have that function, open the file in the free Adobe Acrobat Reader program (which you can get here) and print it from there. I suggest printing on white cardstock or matte photo paper, but regular printer paper is fine, too. 3. Then enjoy your printable! If you want to resize the printable to be 8 x 10″ so you can frame it, do the following- In Adobe Acrobat Reader go to File- Print- Properties. Under “Printer Paper Size” choose 8 x 10.” Click “OK.” Then under Page Handling set “Page Scaling” to “Fit to Printable Area.” Then print, trim, and frame! 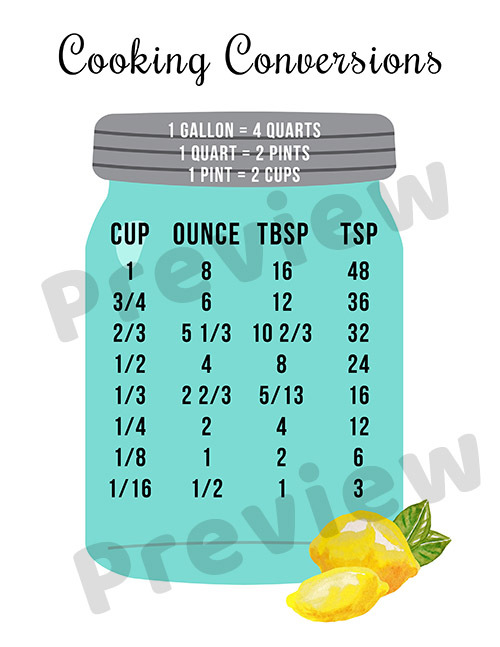 I made this printable using watercolor lemon clipart graphics from Digital Download Shop on Etsy (affiliate link). If you want to make your own inexpensive printable decor, the Digital Download Shop is a great source for graphics! How often do you find yourself doing cooking conversion math? This post contains affiliate links to Amazon and Etsy, which means that I may earn a small commission from some of the links in this post. Please see our Disclosure Page for more information.